The cushion solitaire Forever One Moissanite pendant gives you the sparkle and brilliance of a brilliant cut stone but in a more square shape than the classic round. Available in four different sizes, you can choose from smaller and more understated at the 5.5mm size to a larger, more blingy piece at the 8.5mm size. 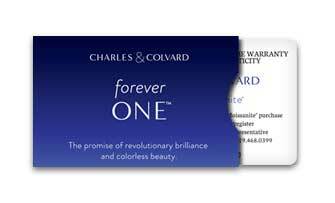 Remember that Charles and Colvard Forever One Moissanite is comparable to a D-F color diamond so whichever size you choose, the stone will be quite white and brilliant.